What is a Chinook? Webster's defines it as: 1) an Indian Tribe of the Pacific Northwest, or 2) a dry, northwest wind of the Rocky Mountains. Not even close. Whoever designed and named this one must have had a twisted sense of humor. My Chinook is a miniature motor home. 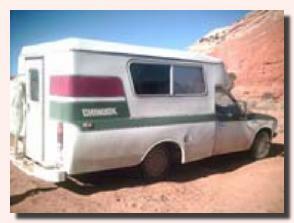 A camper shell built on the frame of a 1976 Toyota pickup. It's underpowered, overweight, so low to the ground it can barely clear speed bumps, has a pathetic use of space, crammed full of useless junk. But, I was without any car, desperately in need of transportation, and a friend said I could drive it for the summer, 'free' - if I could get it running. When I first saw it, it was sitting abandoned in a field, needed tires, battery, and the inside was trashed. My first reaction was to walk away. This sure wasn't what I had in mind. But since nothing else was making itself available....decided I had to give it a try. After an afternoon's work, we did get it running and I drove it home. Keeping it running became my summer's full-time challenge. It ran, and then it didn't. Started, and then wouldn't, and left me stranded on more than one occasion. Many times I felt like hauling it back just to get it out of my life....but then what? I still had nothing else for transportation. This seemed to be the only thing that was being provided, so I turned it over, kept the Chinook, kept fixing, and kept looking (and praying) for its replacement. When this started I did know the basics of auto care - changing oil, checking tire pressure - but, that's about where my knowledge stopped. That wasn't good enough anymore. In my nomadic lifestyle where I must seek out remote, isolated sites where I can be free from electromagnetic and radio/microwave radiation, there isn't a nearby, handy mechanic (which, living with no income, I couldn't afford anyway). Nor are there any neighbors with which to share rides. Fortunately, Gary Duncan is a pretty good mechanic, and over the course of the summer, taught me - system by system - how to repair and maintain this Toyota. Didn't think I'd take to it, but I actually (due to necessity) got pretty good at it and by the end of the summer had it running, not great, but at least fairly dependably. Two months, and five hundred dollars later...summer was nearly over, I still had found nothing else to drive, had given the Chinook the beginning of a new life, thought it deserved better than to be abandoned again, and so I bought it. Took it to Utah for the winter to begin its transformation into what would be my new home. As the toxification of the planet continues to escalate with more and more cell towers, smart grid, broadband, even wireless communication now being used to track truckers on highways and being run through underground gas lines, we as hypersensitives are having to go to more and more remote locations to find safe places in which to live without the constant bombardment of radiation. The reality and difficulty of this dire situation became the inspiration for The Raven's Nest. Until that can happen, and we can start taking down the cell towers, get rid of the toxic radiation, and restore the living conditions on the planet, something else needed to happen. The converted trailer I was living in can't do what we now need. (www.smartshelter.com/RFmicrohabitats.htm ) And so a new concept...the K-11, M2, Micro Habitat...a lightweight, safe, shielded, 4 wheel-drive, high-clearance, mobile domicile that can take us virtually anywhere. Although the Chinook doesn't qualify in a lot of areas, it became the prototype. I stripped the inside, insulated and rebuilt it, built a new, insulated roof (one that I could stand up in), and after 4 versions, a stove for heat. I now heat my home with a section of heating duct and an RV stove burner. With spring now returning to the desert, and the Chinook nearly done and running well, (this after I took apart the carburetor, cleaned it, and put it back together. (Yes, I really did. Only took me 3 days), so begins the saga of my new lifestyle. My first trip, to take Gary up-country to pick up his truck (on which to build his own M2), was a journey of less than 500 miles (round trip) that I took 10 days to make, arriving back in Utah in pretty good shape, and without being destroyed. A first for me. A journey like that before would have put me down for days, if not weeks, due to the exhaustion and pain caused by exposure to not only the magnetic fields from the vehicle, but all the toxic radiation from power lines, cell towers, etc., to which you are constantly exposed while on the road. But with the Chinook, I was able to take my time, find safe places to sleep, stay for a day or 2 when needed to recover, and be completely comfortable. Am just getting a taste of the freedom it's given me to travel, and have spent a lot of time in documenting the tree die-off - now proven to be caused by microwave/radio radiation. Yes, your cell phone is killing the planet. More on that in The Killing Fields. Here are a couple of places I've been able to visit. Those of you familiar with SW Colorado will recognize this spot as Red Mountain, just south of Ouray. A narow valley ending in an 11,000 ft. plus mountain pass of unparalleled beauty. A favorite spot of mine, especially in the fall when the aspen turn gold and shimmer against the blue sky and red mountains. A pretty tough climb for the Chinook, but made it without trouble, just a bit slower than most. Notice the new paint job on the Chinook. (If you can see it). That's elastomeric paint with ferrite mixed in. A black, fine, iron ore that is microwave absorbant. Mixed, not thoroughly, just enough to give it a sort of marbled look. Applied to not only look better, but help give a little shielding from radiation. Valley of the Gods in southern Utah. I spent 3 wonderful days here enroute (the scenic route) back to Moab this fall. I might add that all these pictures are possible because of a new digital camera purchased for me by Smart Shelter. While I had nearly given up on my photography because of the EMF radiation produced by the scanner, computer, and printer, this simplifies the task so much that I am looking forward to being able to continue this art form...in just a slightly different mode. Stay tuned to more pictures as I learn how to use this one. Wondering where this little Chinook will take me next??? I'm planning on heading off for Arizona in just a few weeks - to spend the winter in a warmer climate. A journey of at least 500 miles (one way). Something I could only dream of before the Chinook and the shielding, remediation techniques we have developed. Guess what? The Chinese were right. We now believe that the electro-magnetic/microwave raditaion is effecting us through our merdian system. This is what is causing our exhaustion, headaches, short-term memory loss and all the other ES (electro sensitive) symptoms. With grounding, and daily self massage, I can now speeden the disapation of the toxic radiation. Dramatically lessening those debilitating effects and shortening my recovery time. I no longer have to spend days/weeks recovering from a town trip. What a gift! Well, I did it. I'm launched and on my way to Arizona for the winter. First stop...back to Valley of the Gods for 4 days to rest and get ready for the rest of the journey. As an ES (Electro-Sensitive), I can't just pull off anywhere to sleep. We must locate 'safe' places along the way, and I have those, enough to get me to Flagstaff. From there, it's new and unknown (from an ES standpoint) territory. Wish me luck! Next stop - Navajo National Monument. I've always wanted to see this, and have been in contact with one of the rangers there. She seemed to think their campgrounds woul d be safe for me. However, not so. One was in direct line-of-sight to a whole array of towers. The other right next to their power line and living quarters. But, I was just way too tired to go any further, (and nowhere else to stop on the reservation). Spent a fairly decent night, with a little sleep. Thanks only to the shielding techniques we've developed. And woke to ....snow! And the promise of more to come. Time to leave anyway and find somewhere safe. No tour of the ruins, so had to settle for a little hike (in the snow and cold) to an overlook. It's a system of incredible canyons and valleys, cliffs and alcoves. Breath-taking and beautiful. For those not familiar with Navajo national Monument, this is the Anasazi ruin called Betatikin. Also in the Monument are the ruins of Keet Seel and nearby Inscription House. Spent the next night north of Flagstaff, in a safe location. Had a wonderful night's sleep....YEAH!! But... woke to 16 degrees. BRRR! But,. nice and cozy with the heater in the Chinook. All the trials and time surely paid off on this one. Should have stayed put and rested. Two full days of driving is pushing my limits. That would have been the smart thing to do, but didn't. Something was pulling me on. Weather forecast for Flagstaff was continued cold. Twenty degrees warmer in Sedona....just 45 minutes further south. Thought I could make it. And I did, but turned into a long, tough, painful day. Started going downhill with exhaustion, and still had to find a place to stay. That turned into a difficult task. Between the cell phone towers and power lines, this wonderful, red rock country is being radiated to death. And it shows. Everything is dying...just like the forests. After driving and hiking...driving and hiking. And moving 4 times, I finally found a couple safe sites. Spent the next 2 weeks recovering and then enjoying the warm weather. It was fantastic and worth the trip. Those of you familiar with old western movies will recognize this... Cathedral Rock near Sedona. In Cottonwood, I got to attend a Contra Dance and meet a few of the locals. A great, fun evening. From Sedona/Cottonwood area, I finally headed on through the town of Jerome, and then Prescott. (Cold and snowy. Trying to stay ahead of yet another storm). Winding, twisting roads. Gorgeous country. Would fit in Colorado just fine. And finally, at Yarnell, dropped down the Mogollon Rim into the Sonoran Desert and my first view of the majestic Saguaro. Yes, I made it! I had thought it would take me a month. Should have, but didn't because of the weather. However, I made it in pretty good shape. Tired, but not exhausted. Had to spend another night in direct line-of-sight to cell towers (this one was tough) before I could find a safe site, but those sites are here. Now, the rest of the winter is before me to explore and enjoy this interesting country. But....a very depressing discovery. Electro-Magnetic/Microwave Radiation is killing, not only the trees in Colorado, but the cactus/saguaro in Arizona. There truly is 'no living thing that is NOT reacting to this radiation'. The highlight of my stay near Wickenburg? Because of my inability to travel, especially to somewhere like Oklahoma, (too much radiation exposure and nowhere to go for safe sites), I haven't been able to visit my family for nearly 6 years. But....I finally got to see one of my sons!!! Just a coincidence? He just happened to be attending a training session in Tempe. The other side of Phoenix and I knew the trip would be a killer for me, but how could I not? So I did. A 2 hour drive there - right through the heart of Phoenix - and then nearly 2 hours back to my safe site, but what a wonderful visit. Yes, I was pretty well devestated for the next couple of days, but also yes, it was worth it. That alone has made this winter's trip. Vulture Peak south of Wickenburg. Doesn't look like a vulture to me. Maybe you have to see it from the other side. I spent 5 weeks in Wickenburg and found some nice people, neat country. Even got to drive the Castle Hot Springs road. A little muddy, but the Chinook took it just fine. Canyons in a rainbow of colors. (Completely radiated by a power line right down the center!). A true desert oasis at the hot springs, although they were closed so didn't even get a soak. That was a huge disappointment. We get so much relief from the grounding/soaking in hot springs. The weather has turned cold, cloudy, rainy and just plain nasty. This isn't what I came to the desert for! And so, since I - and the Chinook - seem to be doing so well, I decided to head west and south until I can find warm and sun. Kofa National Wildlife Refuge - a huge valley ringed with tall mountains. What looked like a haven protected from all sources of radiation. Found a neat little camp site and settled in for my 2 weeks of exploration and hiking. We'd spent the fall documenting the deadly impacts that electromagnetic, digital, microwave radiation being sent down power lines and over cell towers is having on our forests. Now Gary is talking with a biologist in Utah who is dealing with the 'mysterious' decline in their bighorn sheep population. Are they also being effected by this radiation? Seems like a no-brainer to me. And here I am in Kofa. A refuge established to protect those bighorn. A population that turns out has also had a 'mysterious' 50% decline in the past several years. Their study had looked at everything but, and concluded that nothing they could identify was the cause. I was able to contact the biologist there and begin conversations about radiation being the cause. And she's listening. Although the Chinook can't travel down most of the roads there - just too rough for it - I was able to produce a map of the area, marking all the known radiation sources. Will be very interesting to see what research comes from this. A bit of personal research developed there also. My campsite seemed very well protected, and I felt pretty well there, but not as good as I should have, given that there were no radiation sources. But I kept having unexplained headaches, depression and exhaustion. Just couldn't seem to get over it. Just over the horizon from my camp was something that resembled a weather balloon, or blimp, or something. Kept wondering about it. Although my camp was usually protected, while hiking, it was usually visible. (Seemed like it was tethered and so blew somewhat in the wind). While talking with Lindsay, the biologist, I finally learned that this was a Border Patrol Radar Blimp. That immediately answered all my questions. Electro-sensitivity was first identified after WW 2 when people started getting sick around the then new radar installations, calling it "radio wave sickness". Imagine how much more intense and powerful that radiation is now. But, of course, it's harmless, right??? The level of cover-up and denial continues to get deeper, sicken, and amaze me. Will we never learn? Now we know that we're not only killing ourselves, but every living being on the planet. And all for the consumer greed and convenience of instant communication. My time in Kofa too quickly came to an end. And I was ready to move on. Although I did find the warm and sun, Kofa appears to be a wind tunnel, with nearly constant, howling, cold, north winds. And no nearby support community. Quartzite was a disgusting mass of people and RV's crammed like sardines into a town with nothing. Blythe was even worse. Yuma, although might be some interesting things, was just too far away, with the stench of pesticides from the agricultural fields that surround it. On up river to Parker. An interesting little community on the Colorado Indian River Tribes Reservation. My site there was in an old mining district. Rugged, fascinating, but turned out to be the local shooting range and ATV area. The noise and constant traffic soon ran me out. A day trip into California, looking for quiet, safe sites, found "No Camping" signs, huge areas of public lands being decimated by off-road vehicles, palm trees, and some interesting 'wildlife'. (Think this one would have gotten in the Chinook with me if I'd offered food). And in the meantime, the Chinook got new brake pads and a working horn. . Since I couldn't find another safe site near Parker, it seemd time to continue up-river. Next stop, Lake Havasu City. I arrived just in time for their "Spring Frenzy" week of classes at the community center. Lake Havasu City turned out to be a nice community. Organic food, some interesting cultureal events, but a nightmare for an ES. Not just 1, but 2 huge Class 1 cross-country power ines! And just like the rest of the Colorado River corridor, another popular 'Snow-bird' destination. By now I've also discovered that, although I might also be considered a snow-bird, the only thing I have in common with the majority of them is the desire to get out of winter. They come to take from the community. Sometimes over-take it, smothering, suffocating it. Using up its resources. Giving nothing in return. I come in search of the neat communities with bright, interesting, intelligent, artistic people I want to be a part of, contribute to. I want these places to be better becuase I was there. I'd soon had enough of Havasu and then received a piece of great news. My best friend was finally able to get away and was on his way to meet up with me for the rest of the winter! I'd been looking at the Contra Dances (these are old Celtic folk dances which I are a great time and I love, but sometimes hard to find) in Las Vegas and we decided that might be a good place to meet. And we did. Where to go from here? Was I in for a treat for the rest of the winter!!! What a way to end the winter! We found some amazing little communities, hot springs, and palm trees. Spent 2 wonderful months exploring the area. No, I won't tell you where....just somewhere around Death Valley. I will warn you about Nevada roads. The Chinook went through both spare tires. In fact, we had 5 flat tires in less than 2 weeks! But, guess there is good news....the Chinook ended up with 4 new (relatively), bigger, tougher, 6-ply truck tires. What I'd been looking for all along, and couldn't find in colorado. Drives like a different truck. All good thing must end (Why??? Who made up that rule???) But so did our time in ??? The weather was beginning to heat up, I needed to get back to Colorado, and since the Chinook doesn't like interstates anyway (we do 50 m.p.h. )...I decided to take the scenic route back. Through places I've always wanted to see, but never had the chance before. And who knows when it will come again. A great decision....Was I in for a treat! Escalante/Grand Staircase was breath-taking ( miles and miles with no power lines or cell towers). It was Heaven! San Rafael Reef is unbelievable in colors and contours. My time through was way, way too short. I must return sometime soon to explore further.